Here are some more shots of the ways I’ve sorted all the things I need in the studio. 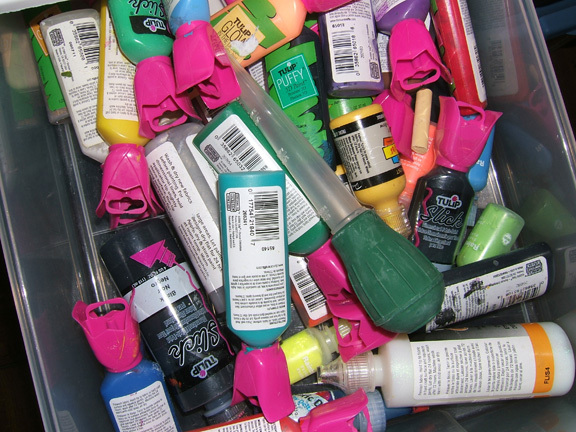 I’m not a neatness freak at all, but I do require that I know where things are so I don’t have to look for them. Even when I’m less organized than I am at the moment, I still know where to put my hands on just about everything I want. 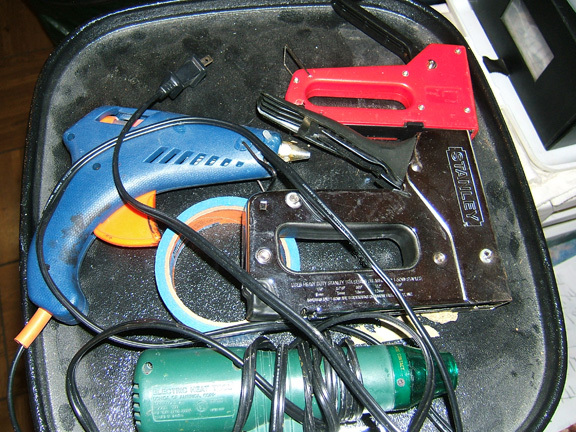 Top of a hair stylist's cart, where I keep tools out that I use all the time, ready for a quick reach. Mostly things that make marks, plus some tape, glitter, etc. 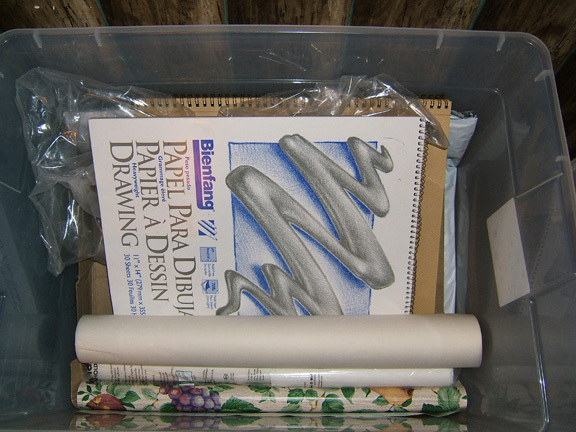 Rolled up paint skins, along with surfaces to make more (freezer paper, waxed paper, and foil.) 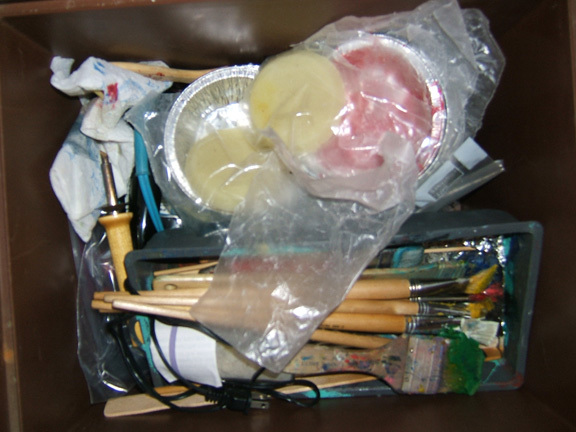 I'm sad that the paint skins I'd collected from my paint palettes over the past two years got left behind in the move. I'll now have to rebuild my collection. Maybe when I get everything stacked in tubs along the wall I will post some more pictures. 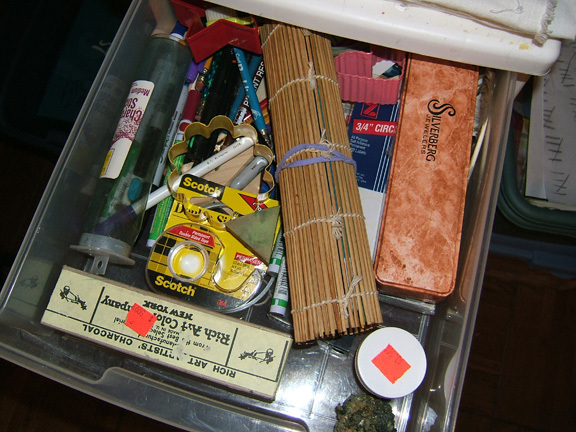 The more I organize, the more I enjoy being there in the studio. I think my mother’s rocker will get a lot of use. Wow, you’re good…everything at your fingertips. 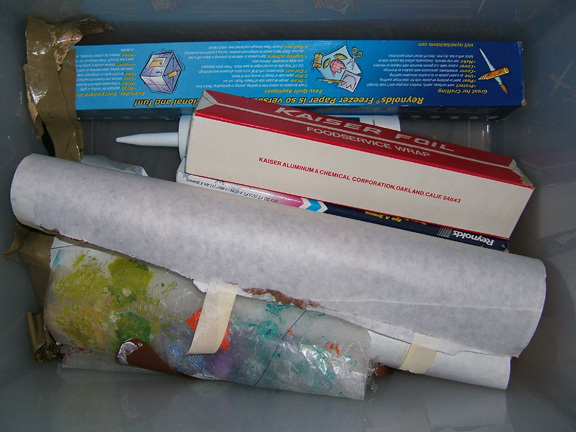 You mentioned encaustic medium; do you purchase or make your own? Just curious. I found a youtube vid tutorial on making your own, but time is always an issue when working a day job. Haven’t gotten into encaustics yet, but I can dream. I’m going to look for the video you mention. It would be nice to see someone else do it. I learned how just from reading several sources. Oh yes I know. I’m convinced that my stuff keeps mating in the dark and is having sprouts. Sometimes it is even useful. Can you come and oragnise mine? Much as I would love to, Charlotte, I can’t afford the air fare. Thank you for visiting and commenting! I’m happy to discover your blog.